With the ADT Pulse system you can have complete control over your home security system from anywhere at any time. Flexible and modular service packages alolow as much or as little automation and control as you like. The ADT Pulse system can also allow you to automate and manage your homes systems remotely. Wall switches and electrical outlet modules allow remote control of lights and small appliances. The ADT Pulse system can just as easily be used for businesses as it can for homes. Help employees feel safer and more comfortable. Help prevent theft from customers and staff. Know if something goes wrong at work right immediately, even when you are away. 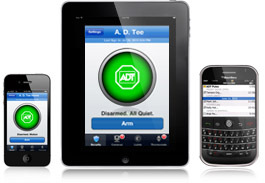 Contact us for ADT-Monitored Security systems with the ADT Pulse system for home or business. Additional services offered by Alpha Security Concepts: video surveillance, fire and medical alert and intercom systems.